Where do I use my Office Shoes voucher code? Find your preferred code for Office Shoes on NetVoucherCodes. Follow the link to the Office website. When you have found the shoes for you, select your size and click ‘Add to Bag’. Enter your shoes ‘Voucher Code’ and click ‘Apply’. Watch your total decrease then click ‘Continue Securely’ to finalise your transaction. First established as a department store concession stands in 1981, Office swiftly rose to prominence with the launch of its own standalone store three years later. Moving away from its humble beginnings Office is now your go-to hub for the biggest names in streetwear at the lowest prices. Featuring an impressive array of brands such as Clarks Originals, Fred Perry, Kickers, Lacoste, Toms, Uggs and Superga, you’ll be certain to find something to suit everyone’s style and taste. Whether you’re shopping for a male or female you’ll be spoilt for choice with the outstanding range of categories Office possesses for footwear. Ranging from Boots, Brogues and Loafers for more formal occasions; to Trainers, Slippers and Sandals for more relaxed moments. If you’re stuck for sizes you will find solace in the size guide section of the Office website. Office shoes are driven to provide you with the best names in footwear at the best prices, despite this, there are still many more ways to save money on your order. Browse the sale on the Office website boasting massive savings of up to 70% on your favourite brands. Sign up to Office and receive a complimentary 10% off voucher for your first order, subscribe to the Office newsletter to be in the know about exclusive offers and competitions. Free standard delivery on full price items. 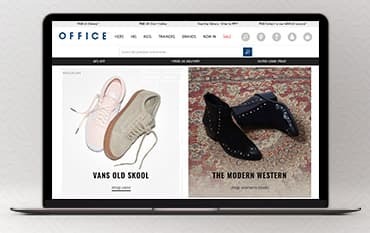 Treating yourself to a new pair of kicks isn’t always the cheapest of ventures, however, Office Shoes has devised a sale section committed to providing Men’s casual shoes starting from £15. Including all the same big name brands such as Clarks Originals, Fred Perry, Kickers, Nike and Original Penguin, perfect for if you’re seeking a bargain gift or affordable accessory for finishing off an outfit. Save up to an enormous 70% off on ex-display shoes at Office’s partner website, Offcuts by Office. Offering exclusive one-off last pairs of shoes, Offcuts is the perfect location to grab a bargain on unique footwear no longer available on the high street. Sold individually as one item, be sure to act fast and order on this limited stock to avoid missing out on a stylish set of shoes, at a special price. Office's standard delivery service is operated by Yodel. Delivery times are between 8am and 8pm Monday to Friday. Orders will take up to 3-5 Working Days. Email and SMS tracking alerts will be sent should a valid email and mobile number be given at the point of checkout. Items purchased online can be returned to the online returns team or to a High Street store (excluding concessions), within 28 days of delivery. All returned items must be unworn and in their original condition. To obtain a refund or exchange, proof of purchase must be provided for the item you wish to return. Office opening times are specific to the retail centre they operate in, to find out more information about your local branch, use the store locator tool. Office Customer Service opening hours are: Mon to Fri - 9am to 7pm, Saturday – 9.30am to 4pm. UK - 0330 100 1906. Republic of Ireland - 1800 827 750. International - 004415 63 557381. Calls are charged at between 3p and 9p per minute from landlines. Mobile rates may be higher, please check with your network provider for a breakdown. Established since 1981 Office has been supplying the biggest brand names for over 35 years. Accommodating you for all you fashion-felt needs with an extensive range of clothing items, footwear and accessories, from all your favourite big brands and more. Use our Office Shoes voucher codes to make great savings on your next footwear purchase. Office is home to savings of up to 60% off on names like Adidas, Converse, Dr.Martens, Nike, New Balance, Ted Baker and Vans plus much more, with additional savings available when ordering with a code or deal from NetVoucherCodes.